First Heat The Nail Making Contest is an AFC annual event. The rules are to make as many nails as you can in 15 minutes. The nails are made from 1/4" bar and must be 1-1/2" long. Each nail must have a point, a head and theoreticaly be drivable. The head must extend over all four sides. The second place contestant can challange the first place contestant for a remach. Ties are broken by a remach using bigger stock. Big Bob Watt was the judge (center rear in blue and white). In front is Tom Clark with Doug Merkel as fireman. Right rear is Allen Kress with Roger Schafer as fireman. Left rear is Harry Brock with Brad Stirling as fireman. Off to the left and not shown is Jack Wheeler with Pete Brandenburg as fireman (sorry guys). Tom Clark makes headers and is last years winner. He takes this contest seriously and took every advantage he could. You may notice that the Clark/Merkel team's fire is a slightly different color. They were burning coke! 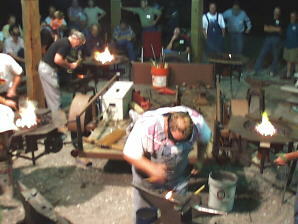 Tom is also using HIS anvil while the rest of the contestants are using the little ones provided by the Montgomery group with their forge. 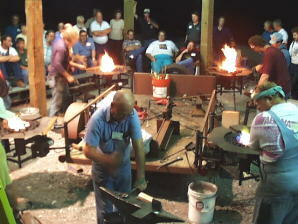 If you are going to enter this contest I recomend you bring your own anvil! Tom produced 30 nails in 15 minutes. None were rejected but many were just barely long enough to pass muster. Others did not do as well and had some pretty embarassing looking nails! Doug Merkel in front with Tom Clark as fireman. Left rear is Mark Linn with his son Mike as fireman. Off to the left is Tal Harris with his wife Kim as fireman. After the second heat Big Bob counted the nails and added points for various things and declared a three way tie between Tom Clark, Doug Merkle and Tal Harris. 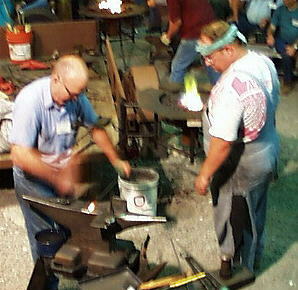 On my suggestion all the contestants used Tom's anvil (and fuel) for the remach to prevent any claims of unfairness.